LinkedIn allows members (both workers and employers) to create profiles and "connections" to each other in an online social network which may represent real-world professional relationships. Members can invite anyone (whether an existing member or not) to become a connection. Since December 2016 it has been a wholly owned subsidiary of Microsoft. LinkedIn participated in the EU's International Safe Harbor Privacy Principles. LinkedIn is headquartered in Sunnyvale, California, with offices in Omaha, Chicago, Los Angeles, New York, San Francisco, Washington, D.C., São Paulo, London, Dublin, Amsterdam, Milan, Paris, Munich, Madrid, Stockholm, Singapore, Hong Kong, China, Japan, Australia, Canada, India and Dubai. In January 2016, the company had around 9,200 employees. LinkedIn's CEO is Jeff Weiner, previously a Yahoo! Inc. executive. Founder Reid Hoffman, previously CEO of LinkedIn, is Chairman of the Board. It is funded by Sequoia Capital, Greylock, Bain Capital Ventures, Bessemer Venture Partners and the European Founders Fund. LinkedIn reached profitability in March 2006. Through January 2011, the company had received a total of $103 million of investment. The site has an Alexa Internet ranking as the 28th most popular website (December 2018[update]). According to the New York Times, US high school students are now creating LinkedIn profiles to include with their college applications. Based in the United States, the site is, as of 2013, available in 24 languages, including Arabic, Chinese, English, French, German, Italian, Portuguese, Spanish, Dutch, Swedish, Danish, Romanian, Russian, Turkish, Japanese, Czech, Polish, Korean, Indonesian, Malay, and Tagalog. LinkedIn filed for an initial public offering in January 2011 and traded its first shares on May 19, 2011, under the NYSE symbol "LNKD". The company was founded in December 2002 by Reid Hoffman and founding team members from PayPal and Socialnet.com (Allen Blue, Eric Ly, Jean-Luc Vaillant, Lee Hower, Konstantin Guericke, Stephen Beitzel, David Eves, Ian McNish, Yan Pujante, Chris Saccheri). In late 2003, Sequoia Capital led the Series A investment in the company. In August 2004, LinkedIn reached 1 million users. In March 2006, LinkedIn achieved its first month of profitability. In April 2007, LinkedIn reached 10 million users. In February 2008, LinkedIn launched a mobile version of the site. In June 2008, Sequoia Capital, Greylock Partners, and other venture capital firms purchased a 5% stake in the company for $53 million, giving the company a post-money valuation of approximately $1 billion. In November 2009, LinkedIn opened its office in Mumbai and soon thereafter in Sydney, as it started its Asia-Pacific team expansion. In 2010, LinkedIn opened an International Headquarters in Dublin, Ireland, received a $20 million investment from Tiger Global Management LLC at a valuation of approximately $2 billion, announced its first acquisition, Mspoke, and improved its 1% premium subscription ratio. In October of that year, Silicon Valley Insider ranked the company No. 10 on its Top 100 List of most valuable start ups. By December, the company was valued at $1.575 billion in private markets. LinkedIn filed for an initial public offering in January 2011. The company traded its first shares on May 19, 2011, under the NYSE symbol "LNKD", at $45 per share. Shares of LinkedIn rose as much as 171% on their first day of trade on the New York Stock Exchange and closed at $94.25, more than 109% above IPO price. Shortly after the IPO, the site's underlying infrastructure was revised to allow accelerated revision-release cycles. In 2011, LinkedIn earned $154.6 million in advertising revenue alone, surpassing Twitter, which earned $139.5 million. 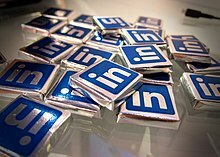 LinkedIn's fourth-quarter 2011 earnings soared because of the company's increase in success in the social media world. By this point, LinkedIn had about 2,100 full-time employees compared to the 500 that it had in 2010. In April 2014, LinkedIn announced that it had leased 222 Second Street, a 26-story building under construction in San Francisco's SoMa district, to accommodate up to 2,500 of its employees, with the lease covering 10 years. The goal was to join all San Francisco-based staff (1,250 as of January 2016) in one building, bringing sales and marketing employees together with the research and development team. They started to move in in March 2016. In February 2016, following an earnings report, LinkedIn's shares dropped 43.6% within a single day, down to $108.38 per share. LinkedIn lost $10 billion of its market capitalization that day. On June 13, 2016, Microsoft announced that it would acquire LinkedIn for $196 a share, a total value of $26.2 billion and the largest acquisition made by Microsoft to date. The acquisition would be an all-cash, debt-financed transaction. Microsoft would allow LinkedIn to "retain its distinct brand, culture and independence", with Weiner to remain as CEO, who would then report to Microsoft CEO Satya Nadella. Analysts believed Microsoft saw the opportunity to integrate LinkedIn with its Office product suite to help better integrate the professional network system with its products. The deal was completed on December 8, 2016. In late 2016, LinkedIn announced a planned increase of 200 new positions in its Dublin office, which would bring the total employee count to 1,200. As of 2015, LinkedIn had more than 400 million members in over 200 countries and territories. It is significantly ahead of its competitors Viadeo (50 million as of 2013) and XING (11 million as of 2016). In 2011, its membership grew by approximately two new members every second. As of 2018, there are over half a billion LinkedIn members. The basic functionality of LinkedIn allows users (workers and employers) to create profiles, which for employees typically consist of a curriculum vitae describing their work experience, education and training, skills, and a personal photo. The site also enables members to make "connections" to each other in an online social network which may represent real-world professional relationships. Members can invite anyone (whether a site member or not) to become a connection. However, if the invitee selects "I don't know" or "Spam", this counts against the inviter. If the inviter gets too many of such responses, the member's account may be restricted or closed. Users can share video with text and filters with the introduction of LinkedIn Video. Users can write posts and articles within the LinkedIn platform to share with their network. In June 2012, cryptographic hashes of approximately 6.4 million LinkedIn user passwords were stolen by hackers who then published the stolen hashes online. This action is known as the 2012 LinkedIn hack. In response to the incident, LinkedIn asked its users to change their passwords. Security experts criticized LinkedIn for not salting their password file and for using a single iteration of SHA-1. On May 31, 2013 LinkedIn added two-factor authentication, an important security enhancement for preventing hackers from gaining access to accounts. In May 2016, 117 million LinkedIn usernames and passwords were offered for sale online for the equivalent of $2,200. These account details are believed to be sourced from the original 2012 LinkedIn hack, in which the number of user IDs stolen had been underestimated. To handle the large volume of emails sent to its users every day with notifications for messages, profile views, important happenings in their network, and other things, LinkedIn uses the Momentum email platform from Message Systems. A mobile version of the site was launched in February 2008, which gives access to a reduced feature set over a mobile phone. The mobile service is available in six languages: Chinese, English, French, German, Japanese and Spanish. In January 2011, LinkedIn acquired CardMunch, a mobile app maker that scans business cards and converts into contacts. In June 2013, CardMunch was noted as an available LinkedIn app. In August 2011, LinkedIn revamped its mobile applications on the iPhone, Android and HTML5. At the time, mobile page views of the application were increasing roughly 400% year over year according to CEO Jeff Weiner. In October 2013, LinkedIn announced a service for iPhone users called "Intro", which inserts a thumbnail of a person's LinkedIn profile in correspondence with that person when reading mail messages in the native iOS Mail program. This is accomplished by re-routing all emails from and to the iPhone through LinkedIn servers, which security firm Bishop Fox asserts has serious privacy implications, violates many organizations' security policies, and resembles a man-in-the-middle attack. LinkedIn also supports the formation of interest groups, and as of March 29, 2012 there are 1,248,019 such groups whose membership varies from 1 to 744,662. The majority of the largest groups are employment related, although a very wide range of topics are covered mainly around professional and career issues, and there are currently[when?] 128,000 groups for both academic and corporate alumni. Groups support a limited form of discussion area, moderated by the group owners and managers. Since groups offer the functionality to reach a wide audience without so easily falling foul of anti-spam solutions, there is a constant stream of spam postings, and there now exist a range of firms who offer a spamming service for this very purpose. LinkedIn has devised a few mechanisms to reduce the volume of spam, but recently[when?] took the decision to remove the ability of group owners to inspect the email address of new members in order to determine if they were spammers. Groups also keep their members informed through emails with updates to the group, including most talked about discussions within your professional circles. Groups may be private, accessible to members only or may be open to Internet users in general to read, though they must join in order to post messages. In December 2011, LinkedIn announced that they are rolling out polls to groups. In November 2013, LinkedIn announced the addition of Showcase Pages to the platform. In 2014, LinkedIn announced they were going to be removing Product and Services Pages paving the way for a greater focus on Showcase Pages. LinkedIn allows users to research companies, non-profit organizations, and governments they may be interested in working for. Typing the name of a company or organization in the search box causes pop-up data about the company or organization to appear. Such data may include the ratio of female to male employees, the percentage of the most common titles/positions held within the company, the location of the company's headquarters and offices, and a list of present and former employees. In July 2011, LinkedIn launched a new feature allowing companies to include an "Apply with LinkedIn" button on job listing pages. The new plugin allowed potential employees to apply for positions using their LinkedIn profiles as resumes. Job recruiters, head hunters, and personnel HR are increasingly using LinkedIn as a source for finding potential candidates. By using the Advanced search tools, recruiters can find members matching their specific key words with a click of a button. They then can make contact with those members by sending a request to connect or by sending InMail about a specific job opportunity he or she may have. Recruiters also often join industry-based groups on LinkedIn to create connections with professionals in that line of business. Since September 2012, LinkedIn has enabled users to "endorse" each other's skills. This feature also allows users to efficiently provide commentary on other users' profiles – network building is reinforced. However, there is no way of flagging anything other than positive content. LinkedIn solicits endorsements using algorithms that generate skills members might have. Members cannot opt out of such solicitations, with the result that it sometimes appears that a member is soliciting an endorsement for a non-existent skill. LinkedIn continues to add different services to its platform to expand the ways that people use it. On May 7, 2015, LinkedIn added an analytics tool to its publishing platform. The tool allows authors to better track traffic that their posts receive. The LinkedIn Influencers program launched in October 2012 and features global thought leaders who share their professional insights with LinkedIn's members. As of May 2016, there are 750+ Influencers, approximately 74% of which are male. The program is invite-only and features leaders from a range of industries including Richard Branson, Narendra Modi, Arianna Huffington, Greg McKeown, Rahm Emanuel, Jamie Dimon, Martha Stewart, Deepak Chopra, Jack Welch, and Bill Gates. LinkedIn Top Companies is a series of lists published by LinkedIn, identifying companies in the United States, Australia, Brazil, Canada, China, France, Germany, India, Japan, Mexico and the United Kingdom that are attracting the most intense interest from job candidates. The 2019 lists identified Google's parent company, Alphabet, as the most sought-after U.S. company, with Facebook ranked second and Amazon ranked third. The lists are based on more than one billion actions by LinkedIn members worldwide. The Top Companies lists were started in 2016 and are published annually. In mid-2008, LinkedIn launched LinkedIn DirectAds as a form of sponsored advertising. In October 2008, LinkedIn revealed plans to open its social network of 30 million professionals globally as a potential sample for business-to-business research. It is testing a potential social network revenue model – research that to some appears more promising than advertising. On July 23, 2013, LinkedIn announced their Sponsored Updates ad service. Individuals and companies can now pay a fee to have LinkedIn sponsor their content and spread it to their user base. This is a common way for social media sites such as LinkedIn to generate revenue. Inspired by Facebook's "social graph", LinkedIn CEO Jeff Weiner set a goal in 2012 to create an "economic graph" within a decade. The goal is to create a comprehensive digital map of the world economy and the connections within it. The economic graph was to be built on the company's current platform with data nodes including companies, jobs, skills, volunteer opportunities, educational institutions, and content. They have been hoping to include all the job listings in the world, all the skills required to get those jobs, all the professionals who could fill them, and all the companies (nonprofit and for-profit) at which they work. The ultimate goal is to make the world economy and job market more efficient through increased transparency. In June 2014, the company announced its "Galene" search architecture to give users access to the economic graph's data with more thorough filtering of data, via user searches like "Engineers with Hadoop experience in Brazil." LinkedIn has used economic graph data to research several topics on the job market, including popular destination cities of recent college graduates, areas with high concentrations of technology skills, and common career transitions. LinkedIn provided the City of New York with data from economic graph showing "in-demand" tech skills for the city's "Tech Talent Pipeline" project. Soon after LinkedIn's acquisition by Microsoft, on January 19, 2017, LinkedIn's new desktop version was introduced. The new version was meant to make the user experience seamless across mobile and desktop. Some of the changes were made according to the feedback received from the previously launched mobile app. Features that were not heavily used were removed. For example, the contact tagging and filtering features are not supported any more. Following the launch of the new user interface (UI), some users, including blogger Zubair Abbas, complained about the missing features which were there in the older version, slowness, and bugs in it. The issues were faced by both free and premium users, and with both the desktop version and the mobile version of the site. On September 1, 2014 LinkedIn retired InMaps, a feature which allowed you to visualize your professional network. The feature had been in use since January 2011. LinkedIn has been described by online trade publication TechRepublic as having "become the de facto tool for professional networking". LinkedIn has also been praised for its usefulness in fostering business relationships. "LinkedIn is, far and away, the most advantageous social networking tool available to job seekers and business professionals today," according to Forbes. LinkedIn has also received criticism, primarily regarding e-mail address mining and auto-update. The sign-up process includes a step for users to enter their email password (there is an opt-out feature). LinkedIn will then offer to send out contact invitations to all members in that address book or that the user has had email conversations with. When the member's email address book is opened it is opened with all email addresses selected and the member is advised invitations will be sent to "selected" email addresses, or to all. LinkedIn was sued for sending out another two follow-up invitations to each contact from members to link to friends who had ignored the initial, authorized, invitation. In November 2014, LinkedIn lost a motion to dismiss the lawsuit, in a ruling that the invitations were advertisements not broadly protected by free speech rights that would otherwise permit use of people's names and images without authorization. The lawsuit was eventually settled in 2015 in favor of LinkedIn members. Changing the description below a member's name is seen as a change in a job title, even if it is just a wording change or even a change to "unemployed". Unless a member opts to "turn off activity updates", an update is sent to all of that person's contacts, telling them to congratulate the member on the "new job". The feature that allows LinkedIn members to "endorse" each other's skills and experience has been criticized as meaningless, since the endorsements are not necessarily accurate or given by people who have familiarity with the member's skills. In October 2016, LinkedIn acknowledged that it "really does matter who endorsed you" and began highlighting endorsements from "coworkers and other mutual connections" to address the criticism. LinkedIn has inspired the creation of specialised professional networking opportunities, such as co-founder Eddie Lou's Chicago startup, Shiftgig (released in 2012 as a platform for hourly workers). In February 2014, LinkedIn launched its Simplified Chinese language version named "领英" (pinyin: Lǐngyīng; literally: 'leading elite'), officially extending their service in China. LinkedIn CEO Jeff Weiner acknowledged in a blog post that they would have to censor some of the content that users post on its website in order to comply with Chinese rules, but he also said the benefits of providing its online service to people in China outweighed those concerns. Since Autumn 2017 job postings from western countries for China aren't possible anymore. On 4 August 2016, a Moscow court ruled that LinkedIn must be blocked in Russia for violating a new data retention law, which requires the user data of Russian citizens to be stored on servers within the country. This ban was upheld on 10 November 2016, and all Russian ISPs began blocking LinkedIn thereafter. LinkedIn's mobile app was also banned from Google Play Store and iOS App Store in Russia in January 2017. The Search, Network, and Analytics (SNA) team at LinkedIn has a website that hosts the open source projects built by the group. Notable among these projects is Project Voldemort, a distributed key-value structured storage system with low-latency similar in purpose to Amazon.com's Dynamo and Google's Bigtable. In the 2013 global surveillance disclosures, documents released by Edward Snowden revealed that British Government Communications Headquarters (GCHQ) (an intelligence and security organisation) infiltrated the Belgian telecommunications network Belgacom by luring employees to a false LinkedIn page. LinkedIn sends "invite emails" to Outlook contacts from its members' email accounts, without obtaining their consent. The "invitations" give the impression that the e-mail holder himself has sent the invitation. If there is no response, the answer will be repeated several times ("You have not yet answered XY's invitation.") LinkedIn was sued in the United States on charges of hijacking e-mail accounts and spamming. The company argued with the right to freedom of expression. In addition, the users concerned would be supported in building a network. At the end of 2013, it was announced that the LinkedIn app intercepted users' emails and silently moved them to LinkedIn servers for full access. LinkedIn used man-in-the-middle attacks. The German Stiftung Warentest has criticized that the balance of rights between users and LinkedIn is disproportionate, restricting users' rights excessively while granting the company far-reaching rights. It has also been claimed that LinkedIn does not respond to consumer protection center requests. In November 2016, Russia announced its intention to block the network in its own country, as it "illegally stores data of Russian users on servers abroad." The relevant law had been in force there since 2014. In July 2018, Credit Wise reported "dark web" email and password exposures from LinkedIn. Shortly thereafter, users began receiving extortion emails, using that information as "evidence" that users' contacts had been hacked, and threatening to expose pornographic videos featuring the users. LinkedIn asserts that this is related to the 2012 breach; however, there is no evidence that this is the case. Massive amounts of data from LinkedIn allows scientists and machine learning researchers to extract insights and build product features.. For example, the data from this resource can help to shape patterns of deception in resumes.. Another example shows, how to use signals from LinkedIn to assess quality of Wikipedia articles and their sources. ^ "Company statistics". LinkedIn. Retrieved 5 April 2019. ^ a b "Linkedin.com Traffic, Demographics and Competitors - Alexa". www.alexa.com. Retrieved 4 February 2019. ^ "Linkedin, About Us, Statistics". ^ "Linkedin: A Short Historical Review". Tiki-Toki. Archived from the original on 27 April 2016. Retrieved 2016-03-24. ^ "LinkedIn – About". LinkedIn Corporation. 2015. Retrieved March 5, 2015. ^ Nicholas Lemann (October 12, 2015). "Reid Hoffman's Big Dreams for LinkedIn". The New Yorker. ^ a b "Account Restricted | LinkedIn Help Center". Help.linkedin.com. 2013-12-20. Retrieved 2015-10-06. ^ a b "EU Data Transfers | LinkedIn Help". www.linkedin.com. Retrieved 2017-12-21. ^ a b c d "LinkedIn connects all its S.F. employees under one roof at Tishman Speyer's tower at 222 Second St". San Francisco Business Times. 2016-03-25. Retrieved 2016-04-02. ^ a b c d e f Hempel, Jessi (July 1, 2013). "LinkedIn: How It's Changing Business". Fortune. pp. 69–74. ^ "LinkedIn – Management". LinkedIn Corporation. Archived from the original on February 20, 2009. Retrieved December 7, 2009. ^ "LinkedIn Secures $53M of Funding Led by Bain Capital Ventures" (Press release). LinkedIn. June 18, 2008. Archived from the original on August 2, 2013. Retrieved August 1, 2013. ^ "LinkedIn Raises $12.8 Million from Bessemer Venture Partners and European Founders Fund to Accelerate Global Growth" (Press release). LinkedIn. January 29, 2007. Archived from the original on August 2, 2013. Retrieved August 1, 2013. ^ "LinkedIn Premium Services Finding Rapid Adoption" (Press release). LinkedIn. March 7, 2006. Archived from the original on August 2, 2013. Retrieved August 1, 2013. ^ "New Item on the College Admission Checklist: LinkedIn Profile". The New York Times. November 5, 2016. Retrieved February 15, 2017. ^ Posner, Nico (June 21, 2011). "Look who's talking Russian, Romanian and Turkish now!". LinkedIn Blog. LinkedIn. Archived from the original on June 25, 2011. Retrieved June 21, 2011. ^ Pepitone, Julianne (January 27, 2011). "LinkedIn files for IPO, reveals sales of $161 million". CNN. Archived from the original on January 29, 2011. Retrieved January 28, 2011. ^ "Founders". LinkedIn. Retrieved 15 July 2016. ^ "LinkedIn". CrunchBase. TechCrunch. Archived from the original on November 29, 2011. Retrieved December 8, 2011. ^ a b c Ann Byers (15 July 2013). Reid Hoffman and Linkedin. The Rosen Publishing Group. pp. 2003–. ISBN 978-1-4488-9537-3. ^ "Announcing LinkedIn Mobile (includes an iPhone version)". Retrieved September 11, 2016. ^ Shinde, Shivani (2009-12-17). "LinkedIn's first Asia-Pac office in India". Business Standard India. Retrieved 2018-01-05. ^ Levy, Ari (July 28, 2010). "Tiger Global Said to Invest in LinkedIn at $2 billion Valuation". Bloomberg. Bloomberg L.P. Archived from the original on December 29, 2011. Retrieved May 16, 2013. ^ "Social Network Ads: LinkedIn Falls Behind Twitter; Facebook Biggest of All" Archived February 3, 2012, at the Wayback Machine. Lunden, Ingrid January 31, 2012. ^ "About Us – LinkedIn". LinkedIn. Retrieved June 13, 2016. ^ "LinkedIn leases 26-story S.F. skyscraper". SFGate. April 23, 2014. Retrieved October 17, 2014. ^ Luc Cohen (February 8, 2016). "CEOs, venture backers lose big as LinkedIn, Tableau shares tumble". Reuters. ^ Rosenfeld, Everett (February 5, 2016). "LinkedIn skids 40%, erases $10B in market cap". Cnbc.com. Retrieved June 10, 2016. ^ Greene, Jay; Steele, Anne (June 13, 2016). "Microsoft to Acquire LinkedIn for $26.2 Billion". Wall Street Journal. Retrieved June 13, 2016. ^ Ciara O'Brien (2016-11-29). "LinkedIn to add 200 jobs at its EMEA HQ in Dublin". Irishtimes.com. Retrieved 2017-02-15. ^ "LinkedIn acquires ChoiceVendor". BusinessWire. 2010-09-23. Retrieved 2016-11-23 – via businesswire.com. ^ Gelles, David (July 22, 2014). "LinkedIn Makes Another Deal, Buying Bizo". DealBook. New York Times. Retrieved 2015-01-14. ^ Lunden, Ingrid (March 16, 2016). "LinkedIn Buys Careerify to Build out its Recruitment Business". Tech Crunch. Tech Crunch. Retrieved 2015-03-16. ^ Ingrid, Lunden (2015-04-02). "LinkedIn Buys Refresh.io To Add Predictive Insights To Its Products". TechCrunch. Retrieved 2015-04-06. ^ "LinkedIn just bought online learning company Lynda for $1.5 billion". Business Insider. 2015-04-09. Retrieved 2015-04-09. ^ KOSOFF, MAYA (2015-04-09). "LinkedIn just bought online learning company Lynda for $1.5 billion". BusinessInsider. Retrieved 2015-04-09. ^ "LinkedIn acquires predictive marketing firm Fliptop to boost its Sales Solutions offering". VentureBeat. ^ "LinkedIn acquires recruiting startup Connectifier". VentureBeat. ^ "LinkedIn buys PointDrive to boost its social sales platform with sharing". TechCrunch. ^ "LinkedIn acquires employee engagement platform Glint". TechCrunch. ^ "PacerMonitor Document View – 5:13-cv-04303 – Perkins et al v. LinkedIn Corporation, Docket Item 1" (PDF). Pacermonitor.com. 2013-09-17. Retrieved 2015-10-06. ^ a b "LinkedIn settles class-action lawsuit – Business Insider". Business Insider. October 2, 2015. Retrieved October 3, 2015. ^ UNITED STATES DISTRICT COURT, NORTHERN DISTRICT OF CALIFORNIA SAN JOSE DIVISION (September 17, 2013). "Preliminary Approval Order" (PDF). addconnectionssettlement.com. GILARDI & CO LLC. ^ Rynne, Alexandra (February 1, 2017). "10 Surprising Stats You Didn't Know about Marketing on LinkedIn". LinkedIn Marketing Solutions Blog. Retrieved 2018-10-15. ^ "400 Million Members!". LinkedIn Blog. LinkedIn. October 29, 2015. Retrieved October 29, 2015. ^ "Now at 50 m users, LinkedIn rival Viadeo acquires French startup Pealk and announces US innovation lab". January 14, 2013. ^ "XING AG". corporate.xing.com. Archived from the original on August 3, 2016. Retrieved September 10, 2016. ^ "LinkedIn Members 2018". linkedinsiders.wordpress.com. Retrieved January 22, 2018. ^ Spiegel, Linda (June 1, 2016). "How Job Hunters Should Use LinkedIn Second-Degree Connections". The Wall Street Journal. Retrieved June 27, 2016. ^ "Introducing LinkedIn Video: Show Your Experience and Perspective". blog.linkedin.com. Retrieved 2017-12-01. ^ "LinkedIn Just Launched Some Snapchat-Like Features for Video Creators". Retrieved 2018-03-20. ^ "Linkedin Publishing". www.linkedin.com. Retrieved 2017-12-01. ^ "LinkedIn Just Added Two-Factor Authentication, So Enable It Now". Lifehacker.com. 2013-05-31. Retrieved 2015-10-06. ^ "LinkedIn resetting passwords after 117 million user credentials stolen". MashableUK. Retrieved 2016-05-19. ^ "The biggest email provider you've never heard of". Fortune.com. Retrieved 2015-10-06. ^ Intelligence, Dell SecureWorks Counter Threat Unit Threat. "Suspected Hacker Group Creates Network of Fake LinkedIn Profiles". www.secureworks.com. Retrieved 2017-10-12. ^ Fox, Bishop (2013-10-23). "LinkedIn 'Intro'duces Insecurity". Bishop Fox. Retrieved 2015-10-06. ^ Fox, Bishop (2013-11-01). "An Introspection On Intro Security". Bishop Fox. Retrieved 2015-10-06. ^ "World's Largest LinkedIn Group Breaks The 700,000 Member mark". i-newswire.com. Retrieved February 28, 2012. ^ "How to Avoid LinkedIn's Site Wide Automatic Moderation (SWAM)". Socialmediatoday.com. Archived from the original on June 27, 2014. Retrieved October 17, 2014. ^ Lerner, Mark. "How To Avoid LinkedIn's Site Wide Automatic Moderation". Oktopost. Archived from the original on March 24, 2014. Retrieved March 24, 2014. ^ Pinkovezky, Aviad (November 19, 2013). "Announcing LinkedIn Showcase Pages". ^ Everett, Paul (August 6, 2014). "LinkedIn Company Product & Services pages being discontinued". ^ Levin, Valerie (June 29, 2014). "Crash Course: LinkedIn Showcase Pages 101". Archived from the original on October 16, 2014. Retrieved October 7, 2014. ^ a b Colleen Taylor, GigaOm. "LinkedIn launches job application plugin." July 25, 2011. Retrieved July 25, 2011. ^ Arnie Fertig. "6 Ways Recruiters Use LinkedIn to Headhunt". US News & World Report. Retrieved July 3, 2015. ^ By Ingrid Lunden, TechCrunch. ""Who's Viewed Your Posts?" LinkedIn Adds Analytics To Its Publishing Platform." May 7, 2015. May 7, 2015. ^ "Will LinkedIn Address the Influencer Program's Gender Lopsidedness? ", LinkedIn Pulse, 14 June 2016. Retrieved on 28 June 2016. ^ Kaufman, Leslie. "LinkedIn Builds Its Publishing Presence", The New York Times, New York,16 June 2013. Retrieved on 19 July 2013. ^ Roth, Daniel (April 3, 2019). "LinkedIn Top Companies 2019: Where the U.S. wants to work now". LinkedIn. ^ "LinkedIn Direct Ads vs Google Adwords". Shoutex.com. Retrieved 2015-10-06. ^ "LinkedIn Expands Ad Program With Launch Of Sponsored Updates Program". Techcruch.com. Retrieved 2015-10-06. ^ "The most attractive cities worldwide for new graduates – Quartz". Qz.com. 2014-06-04. Retrieved 2015-10-06. ^ "Where Is the Top City to Spot Tech Talent?". Blogs.wsj.com. 2014-06-24. Retrieved 2015-10-06. ^ "Oh, the Places You'll Go! (Or Not.)". Blogs.wsj.com. 2014-12-08. Retrieved 2015-10-06. ^ "LinkedIn Economic Graph Research: Helping New Yorkers Connect With The Jobs Of Tomorrow [INFOGRAPHIC]". Blog.linkedin.com. Retrieved July 3, 2015. ^ "Filtering and Tagging Connections Feature – No Longer Available". LinkedIn Help Pages. February 2, 2017. ^ Wasserman, Todd (Jan 17, 2013). "LinkedIn will pull the plug on LinkedIn Answers, its Quora-like Q&A service, on Jan. 31". Mashable. ^ "LinkedIn Is Quietly Retiring Network Visualization Tool InMaps". Retrieved 27 November 2017. ^ Niu, Evan (May 20, 2015). "This Company Has The Best Business Model in Social Media". The Motley Fool. Retrieved June 13, 2016. ^ Foss, Jenny (July 6, 2012). "Your LinkedIn Intervention: 5 Changes You Must Make". Forbes. ^ "Judge Rejects LinkedIn's Free-Speech Argument In Battle Over Email Invitations". Mediapost.com. Retrieved July 3, 2015. ^ "LinkedIn is making its endorsements feature a lot smarter to help people find jobs". Business Insider. Retrieved 2017-03-26. ^ MacArthur, Kate. "Shiftgig hires LinkedIn vice president as new CEO". chicagotribune.com. Retrieved 2017-09-20. ^ "No Job Postings for China on LinkedIn anymore". Stephan Koß. November 10, 2017. Retrieved January 22, 2018. ^ "Russia is erasing Linkedin from app stores". The Verge. Vox Media. Retrieved 7 January 2017. ^ "Moscow Court Upholds Decision to Ban LinkedIn in Russia". The Moscow Times. Retrieved 10 November 2016. ^ "SNA-projects.com". SNA-projects.com. August 11, 2011. Archived from the original on July 15, 2012. Retrieved December 8, 2011. ^ "Project-voldemort.com". Project-voldemort.com. Archived from the original on April 23, 2011. Retrieved December 8, 2011. ^ LinkedIn argues it has free speech right to email Mediapost.com in 19 September 2014. ^ LinkedIn 'Credit Reports' Give Job Seekers Trouble Courthouse News Service in 13 October 2014. ^ LinkedIn illegally sold your professional data lawsuit claims News Mic in 13 October 2014. ^ LinkedIns new mobile app called a dream for attackers New York Times in 24 October 2013. ^ LinkedIn liest Ihre Mails mit PC-Welt in 28 October 2013. ^ Stiftung Warentest kritisiert Facebook, LinkedIn und Myspace golem.de (German) in 3 March 2018. ^ Soziale Netzwerke: Datenschutz oft mangelhaft Stiftung Warentest (German) in 24 March 2014. ^ "Russland blockiert LinkedIn". Spiegel Online (in German). 2016-11-17. Retrieved 2018-03-03. ^ Andreas Wilkens (2016-11-17). "Russland blockiert Linkedin". heise.de (in German). Retrieved 2018-03-03. ^ Lewoniewski, Włodzimierz; Härting, Ralf-Christian; Węcel, Krzysztof; Reichstein, Christopher; Abramowicz, Witold (2018-08-29). "Application of SEO Metrics to Determine the Quality of Wikipedia Articles and Their Sources". Information and Software Technologies. ICIST 2018. Communications in Computer and Information Science. 920: 139--152. doi:10.1007/978-3-319-99972-2_11. Wikimedia Commons has media related to LinkedIn.